Remi went to a new, wonderful home this week. With my move to Colorado I felt he would do better if he stayed in Texas. As I was sharing Remi’s program with his new owner, I really got to thinking about the process of finding his nutritional sweet spot. Remi is a 19 year old, QH that has been with me for just under 10 years. When Remi came to me he had very contracted heels and horrible thrush in all four feet. Remi was also nervous and tight in his body. Over the past 10 years it has been a journey to find what I call the nutritional sweet spot for Remi. This is the diet that supports his hooves, immune system, his joints and connective tissues, his internal organs and his mental state. When I removed Remi’s shoes, his hooves flared badly. I found to keep him sound I needed to round off the flared wall to put more support on the sole. Remi needed boots and I got quite the education trying to find boots that fit him and did not rub sores. Hoof casts actually worked the best for him but he wore through them quickly. To keep Remi comfortable I resorted to putting him back in shoes with fill in pads to support his soles. Remi stayed in these shoes for about a year while I worked to find the nutritional sweet spot that would allow him to have strong hooves and a comfortable body. I found that Remi loves alfalfa hay but he gets more nervous if he eats very much of it. Lush, green grass has the same effect on him. If the grass is extra green I give Remi some MagRestore, which contains dimagnesium malate. I also had to do this during time of drought, when magnesium is low in the grass. The MagRestore helps with nervousness and body soreness that are caused by low magnesium levels in the diet. The extra magnesium also helps Remi with tenderness in his feet. The thrush in Remi’s feet responded well to the addition of 4 tablets a day AFA blue green algae with the cell wall removed. Like alfalfa, the whole blue green algae gave Remi too much energy. The AFA algae also helped the wall on Remi’s hooves get thicker and grow faster. Even with the thicker walls, Remi still was prone to hoof wall cracks so I added chia seeds to his diet to give him extra quality fat. The combination of the algae and the chia with occasional MagRestore made all the difference in his hooves. Remi’s feet did well but he still suffered from thin soles in wet weather. He could also get very body sore when his feet were tender and this seemed much worse when the weather was damp. I read an article that mentioned chronic yeast or fungal infections as a cause of sore feet and body soreness in horses. This seemed to fit Remi so I changed his feed to rice bran, which has a low glycemic index. Fungus and yeasts are not as likely to flourish with a low carbohydrate diet. The higher fat diet makes sense for Remi since I have typed him as a Yang Ming horse temperament. I also gave Remi a course of MycoProtect, which is a mushroom formula to fight yeast and boost the immune system. I have enjoyed seeing Remi’s overall health improve over time and he went to his new home sound and barefoot. His current diet of quality grass hay, some grazing, rice bran and chia seeds seems to be working well for him. He will be out on 60 acres of pasture with his new horse friend, Hefty. Remi will get ridden a few times a month and will get to work cows on occasion, which he loves to do. Remi has been a joy to be around and he has been a great horse to help me to learn cow sorting. Remi is such a gentleman and once even took a kick from my mare rather than push over me to get out of the way. I have not had enough time to ride him and Cerise so I felt he needed a home where he could get more work and attention. I have been blessed to have Remi and I learned so much in the quest to find his nutritional sweet spot. I hope the payoff for him is many more years of being happy, healthy and sound. 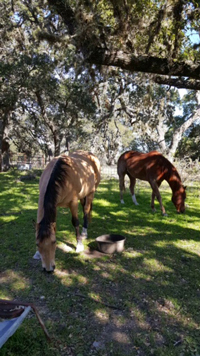 This entry was posted in Feeding Horses, Five Element Feeding, Newsletters and tagged holistic horse care, holistic horse health, horse, horse hoof care, horses on February 1, 2016 by Madalyn Ward, DVM.